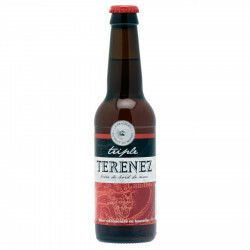 Between lemon and orange: citrus fruits and sweetness are the main features of Blanche Terenez, a beer to taste and enjoy. Between lemon and orange: citrus fruits and sweetness are the main features of Blanche Terenez (white beer), a beer to taste and enjoy. This white beer was refermented into the bottle giving a surprising elixir. The beer enthusiasts will be pleasantly surprised by this refreshing expression, wonderfully paired with a mackerel or pollock rillette. This is an hymn to Britanny, its place of origin. Best served at 3 to 4°. 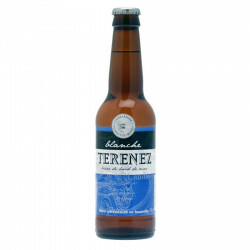 Let the Blanche Terenez breathe 3 to 5 min in a glass so as to reveals all of its flavours. From the sea to the land… La Brasserie du Bout du Monde (Land’s End Brewery) was born in Brittany, 2013, after three years of thinking, research and studies, as “quality and taste flourish with time, and such is the spirit of our brewery”, entrepreneur O. Lallemand says, placing quality at the heart of his concerns. The brewery uses full-bodied mashing schedules (a steady single temperature for the mashing): the mashing process consists of soaking the crushed malt to extract starch. The brewery is unusually located in a former military tunnel where the beers are refined at least two weeks at a temperature of 12 to 14°C. This underground tunnel served as a warehouse for NATO’s ammunition. It was then used by the Ministry of Defense and was bought by the municipality communities in 2009. This beer is an invitation to travel and is the perfect accompaniment to spicy meals and crepes. A genuine Breton beer ! Japon : silver medal 2014, bronze 2015, silver 2016.